For the benchmark in strength and durability for latex gloves, look no further than Diamond GripTM gloves. Diamond GripTM gloves are thicker than typical latex gloves for enhanced protection, and also provide the greatest protection where you need it at the fingertips, to prevent ripping and tearing. 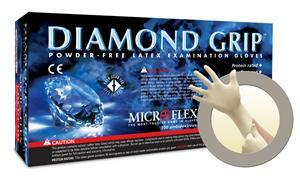 Diamond Grip latex exam gloves give you the best in durability and strength across the board. Simply one of the very best latex exam gloves on the market today.